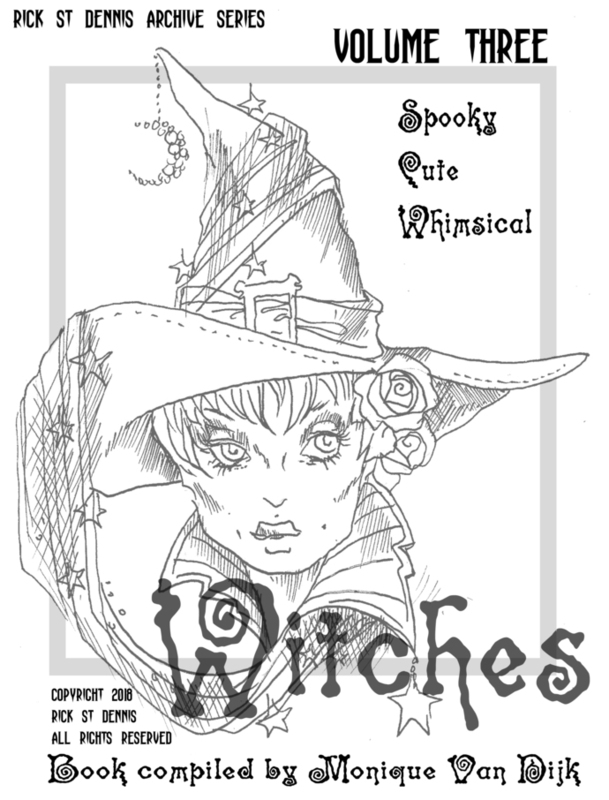 Witches is the 3rd in a series of Archive books containing images that have been published before in a coloring book or as digital stamps in Rick's Zibbet shop. The images will no longer be available in the shop and are archived in PDF downloadable books. You will receive a series of black and white images. (Colored images are for examples only). You can print it, resize it, use it as a repeating design or combine it with other images then color it by hand (or color it digitally and then print). This is a high resolution jpeg file made from the scan of the original pen and ink art ready to resize for your needs. The copyright of this image belongs to Rick St Dennis MFA Artist/Designer and may not be resold or redistributed in any form. You have permission to use the image for your personal use and in creating handmade items. You may sell your handmade items but must not claim the image as your own. Your items for sale must be handmade and not mechanically or mass produced. You may not use this image for print on demand services such as Cafe press or Zazzle. You may not sell or give this design as a digital file or printed sheet. Welcome to my ZIBBET superstore! Here you will find a wide array of products from digital Stamps to PDF downloads of my colouring books, colouring pages and even original art for sale. I have combined all my designs into one shop - simply use the sections to the left to go to the individual departments to target the images you are looking for- some images are cross referenced.